Though I’ve always seen it called “kugelhopf”, this Germanic bread is also known as “gugelhopf”, “kougelhupf”, “guglhupf”, or any combination of the aforementioned prefixes or suffixes. To-may-to, to-mah-to, it’s all the same bread no matter the label. Well, almost. In its native land, kugelhopf is a rich yeast bread, only barely sweetened, and dotted throughout with rum-soaked raisins; but in America, versions tend to be far more cake-like, sometimes not yeasted at all, with a broader variety of fruits. To me, the yeast-leavened sort is the superior one, but I’m not about to tell you to stop enjoying whichever one you prefer. You do occasionally run across savory versions of kugelhopf, with meat and cheese folded into the dough, much like casatiello, the savory cousin of Italy’s panettone. 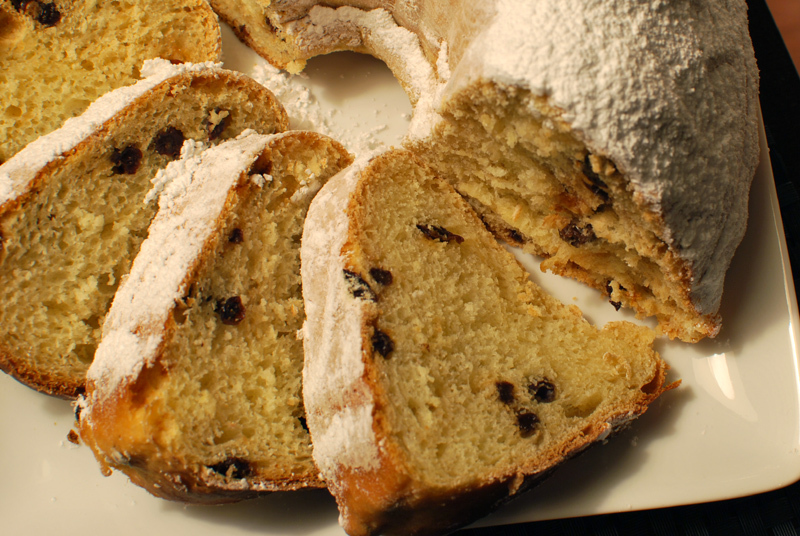 Indeed, many would compare kugelhopf to panettone, as they are both made with a dough enriched with eggs, milk, and butter, and both use generous amounts of dried fruit; but the comparison is not entirely apt. Yes, there are similarities, but panettone tends to be airier, and have more of a brioche-esque pull to the crumb. 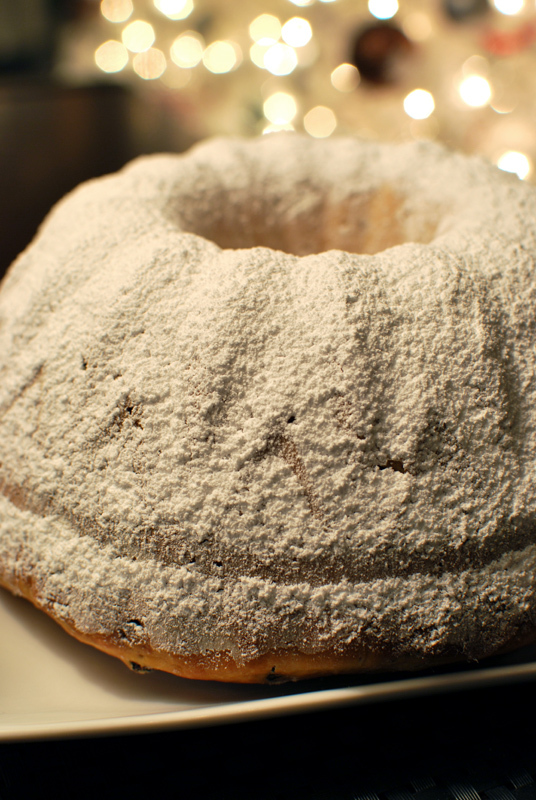 Kugelhopf typically has a shorter crumb, with a texture that may be described as fluffy. Panettone also comes in a variety of flavors from plain to chocolate and everything in between, whereas kugelhopf generally comes in the one raisin-studded sort (savory types aside). Additionally, kugelhopf is often intentionally served slightly aged, as the drier texture better soaks up the traditional accompaniment of coffee or wine; panettone is usually served in a fresher state. I did take small liberties with the dried fruit here, swapping the traditional raisins for currants instead, as I prefer how the smaller currants spread throughout the dough more evenly. Otherwise, this version is a very typically German rendition, not overly sweet, and with a pleasingly complex flavor from the use of a quick starter. No matter what you call it, it’s perfect for enjoying with a coffee in the morning, or a glass of riesling at night. 1. Combine the currants and rum in a plastic zip top bag, and squeeze as much air as possible out of the bag before closing. (This maximizes the surface area contact between the fruit and the liquor, and makes sure no fruit is left dry.) Soak for at least 8 hours, and up to several days. 2. To make the starter, whisk the yeast, water, honey, and flour together in the bowl of a stand mixer. Cover and let stand at room temperature until doubled in size, 45 to 60 minutes. 3. When the starter is fully risen, whisk in the milk, salt, sugar, egg, and lemon zest. Add all but a handful of the flour, and mix at low speed with the paddle attachment until a rough dough forms. 4. Switch to the dough hook attachment. Mixing at medium-low speed, add the softened butter 1 tablespoon at a time, letting each piece incorporate fully before adding the next. Increase the speed to medium, and continue kneading until the dough is smooth and elastic, about 8 minutes. The dough should be slack, but not wet; add additional flour or water as needed to correct the consistency. 5. Transfer the dough to a lightly oiled bowl, cover tightly with plastic wrap, and let rise 45 to 60 minutes, or until nearly doubled in size. 6. Using a nonstick spatula, fold the dough over itself once or twice to deflate. Cover again, and let rise a second time for 45 to 60 minutes, or until nearly doubled in size. Meanwhile, thoroughly grease a kugelhopf or bundt pan, taking care to coat every crevice. Dust the greased pan with a spoonful or two of flour, and shake it around to coat the whole surface (don’t forget the stem on the inside!). Knock out any excess flour, and set aside. 7. Turn the dough out onto a floured surface, pressing gently to deflate. Scatter the rum-soaked currants over the top, and knead in by hand just evenly distributed, dusting with only as much flour is needed to prevent sticking. If any currants fall out, just pop them back in. When fully incorporated, cover loosely with plastic wrap, and let the dough rest 10 minutes. 8. Using the handle of a wooden spoon, poke a hole in the center of the dough. With floured hands, open the hole slightly, and transfer the dough to the prepared pan, placing the ring of dough around the center stem of the pan. Gently press the dough into the pan, making it as flat and even as possible. 9. Cover loosely with lightly oiled plastic wrap, and let rise at room temperature until nearly doubled in size, about 1 hour. Thirty minutes before baking, preheat the oven to 375º F, positioning a rack in the lower third of the oven. 10. Bake the bread at 375º F for 35 to 45 minutes, or until golden brown. An instant-read thermometer should register around 195º F when fully baked. Remove from the pan as soon as possible, and invert onto a wire rack to cool thoroughly before cutting. To serve, sift powdered sugar liberally over the top, and slice into wedges.